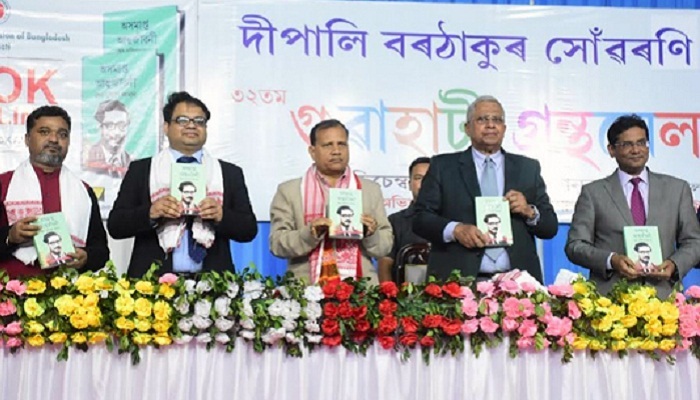 In yet another milestone, Father of the Nation Bangabandhu Sheikh Mujibur Rahman’s much acclaimed autobiography “The Unfinished Memoirs” has been published in the Assamese language. The Assamese translation of the book, written originally in Bengali by Bangabandhu, was jointly launched on Tuesday by Governor of Meghalaya Shri Tathagata Roy, Deputy High Commissioner of Bangladesh to India Rokebul Haque and the President of Assam Sahitya Sova Dr Paramananda Rajbangshi at the 32nd Guwahati Book fair, said a press release of Bangladesh High Commission in India Wednesday. Bangabandhu’s autobiography has already been translated in Hindi, English, Chinese, Japanese, French, Palestine, Arabic, Turkish and Spanish. Speaking on the occasion, Governor Roy elaborated the untold sufferings of Bangabandhu to achieve the independence of Bengali nation. He also termed the book a great legacy to discover true history of the subcontinent from 50s to 70s. Dr Rajbangshi highly applauded Bangladesh’s tremendous economic progress under the charismatic leadership of Prime Minister Sheikh Hasina. Soumen Bharatiya and Dr Juri Sharma, the Assamese translators of the book, said the work provided them with an insight to the sub continental politics surrounding the birth of Bangladesh. Head of Scrutiny Committee of Assamese Manuscript Professor Dr Usharanjan Bhattacharjee and Secretary of the Department of Cultural Affairs Modhurima Sent Baruah, among others, attended the program as special guests. Dr Shah Mohammad Tanvir Monsur, Assistant High Commissioner of Bangladesh gave the vote of thanks to all who were associated in publishing the book. The programme was followed by a colourful cultural function.